I must write this blog quickly. There are so many details that I’ll forget as time passes. Nevertheless I’ll make an effort to recall those most poignant aspects of my recent trip. The month of August in the year of 2012 has been full of adventures. On the first week of that month, I found myself in Seoul, South Korea. It’s nearly a four hour drive from the city in which I live, so I rarely visit. There I ran into a friend and former coworker at a local sauna. We caught up and compared experiences. A week later I spent two days at the UnMun Temple in Gyeongsan. I was invited by a student of mine. It’s the equivalent of a nunnery, however, they welcome male guests for their temple stays. A nunnery is actually a title that is reserved for Catholics so I will refer to the Korean monks by their rightful title — sunim (pronounced soo nee-m). That experience left me with a strong impression of a monk’s life. Monks and nuns live difficult lives. They meditate for hours on end. They purge themselves of worldly trappings and live simple lives. I was so impressed with their way of life that I made it a point to bow to the monk I saw on the subway in Taiwan. She returned my bow. I may have been in a different country where the Buddhist practices are slightly different, but my feeling of admiration is the same. I’ve gotten a little ahead of myself by mentioning my encounter with the monk in Taiwan. It was a week after my stay at the temple in Korea that I found myself in Taipei, Taiwan. Cecilia, my co-worker’s ex girlfriend, was the ex-girlfriend extended an invitation to visit Taiwan nearly one year ago. I finally decided to take her up on her offer. With the upcoming vacation I had time, so I bought an AirBusan ticket to Taiwan. Upon my arrival in Taiwan, I went to the Taipei 101 building. Yet within the first three hours of my trip to Taiwan, I ran into a problem. My toes were suffering from some kind of inflammation. The skin between the toes on my left foot was breaking. It was too painful for me to continue to walk around and so I had to find help. I did not have the use of my cellphone and could not contact Cecilia for help. I felt helpless, but not hopeless. I searched for a hospital on my map and after I found it I jumped into a taxi there. Luckily, there was an International liaison who worked there. He had lived in Texas and was the same age as me. His name of David and his English was excellent. David explained everything to me while I waited to see the doctor. He also suggested that I rely upon the hospital to arrange a room for me to stay for the night. I accepted. After all, I hadn’t made prior arrangements before flying to Taiwan. Also, David said that the hotel room would be offered at a forty percent discount. I thought that my foot had led me to great fortune until I learned that the hotel was listed as one of the many places to stay in Taiwan on the Wikitravel website. Had I just called them before hand and made a reservation, I would have been set. I’ll make arrangements in the future. The next day I bought my first pair of sandals and wore them instead of the shoes I brought. I began to feel my foot heal a day or so later. The swelling went down and it was much more comfortable to walk. Cecilia lives in Taichung, the third largest city in Taiwan, and picked me up from the train station when I went to visit her there. She has a beautiful smile and it was nice to have been met by it when she picked me up. She took me to a night market and the science museum. We then took a train back to Taipei where we shared the cost and amenities of a hotel room. 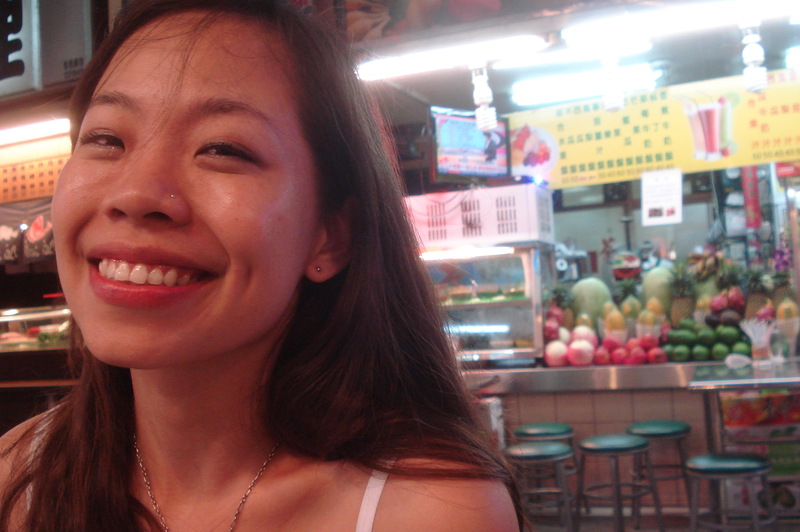 She continued to show me around Taipei — night markets, the zoo, temples, etc. I really appreciate her help with translating for me. She’s a beautiful, smart woman whom I admire and love. Her companionship during my stay was important. More than the places I saw I learned the importance of friendships on my trip. Thank you Larry. it’s the nicest compliment i’ve ever had, I hope you enjoyed the time here and come to visit Taiwan again soon! !